There’s something about the allure of the cleaning aisle…all those pretty bottles all lined up. Especially the eco-friendly ones. I find the packaging and marketing of the green cleaners to be even more appealing – beside them being better for the Earth. But I’ve said sayonara to my cleaners. Now I’m using an amazing product to clean, sanitize, de-grime and de-gunk all over my house. My secret? Well, steam to be exact. I’ve been trying out Wagner’s Spraytech On-Demand Steamer for the last few weeks and have been amazed at its uses from the bathroom to the kitchen, inside to outside. And all with the power of steam. Wagner probably isn’t a household name for most of you (it wasn’t for me), but here’s why it steams the other brands. It’s versatile. Though it’s marketed as a wallpaper removal (Wagner sells other painting products), the On-Demand steamer comes with a total of 6 accessories (wallpaper steam plate, jet nozzle, floor cleaning pad, window/tile squeegee and 2 brush tips) plus two extension tubes for those hard to reach places making it useful all over the home. With the Wagner On-Demand Steamer, you have the versatility to clean everything from your BBQ to your bathroom, stovetop to sink, floors to outdoor fountain, windows to wheel rims. I even blasted some of my youngest son’s plastic toys after a playdate with a sick friend. It’s big enough to get the job done, small enough to be portable. Some of the handheld steamers only hold enough water for 10-15 minutes of cleaning. The Wagner On-Demand steamer can hold up to 48oz and steam for up to 45 minutes. Still its compact size and easy-grab handle makes it a breeze to carry around the house or up a ladder. No cleaners to buy, no chemicals to worry about. You just add water, let it heat up for about 10 minutes and then steam away. Simple, easy and (nearly) free. 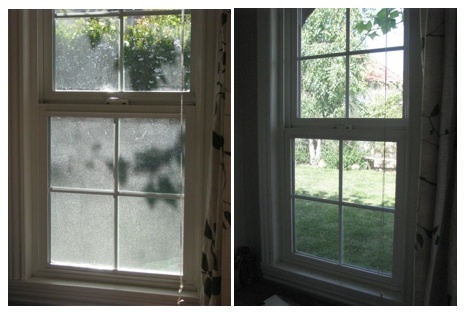 Check out some of my before and afters. And no, of course my windows are not normally this dirty. I, uh, just let them get this way so I could demonstrate the steam cleaner for this review. While I’m a little sad that I won’t have any pretty bottles of eucalyptus lavender lemongrass eco-cleaner to pull out anymore, I’ll find a way to soothe myself. Maybe with a little steam cleaning…. Visit www.wagnerspraytech.com to learn more about the On-Demand Steam Cleaner or find a retailer near you. Or purchase now at Amazon.com. Kate Bayless is a freelance writer and editor with bylines in Parents, American Baby, Parenting, Babble and Momtrends. When she’s not steam cleaning, she can be found at @katebayless or www.katebayless.com. MWS was not paid for this post. A sample was provided for review. Hurrah! At last I got a weblog from where I know how to in fact get useful information regarding my study and knowledge. A lot of times it’s challenging to get that “perfect balance” between usability and visual appearance. I must say you have done a amazing job with this. Also, the blog loads extremely fast for me on Safari. Exceptional Blog!